So they did it. Yesterday the UK Supreme Court ruled that the charging of employment tribunal fees to complainants was unlawful. The fees have been very controversial since they were introduced in 2013. The introduction of fees meant that an employee claiming unfair dismissal had to pay up to £1200 up front in order to submit their claim. Employment claims in the UK saw a serious dive almost instantly when the fees were introduced. The introduction of similar fees was mooted in Ireland when the Workplace Relations Commission was being set up but the idea was quickly dropped. New procedures in the WRC bring enough complaints about access to justice, imagine if fees were a part of it! In my view it was a good decision although many will say that is only because it helps line employment lawyers' pockets. That is not my reason. As an employment lawyer who acts for both employers and employees I feel it is important that there should be meaningful access to justice and there are other mechanisms to deal quickly with poorly grounds, frivolous and vexation claims. It does help keep my UK colleagues in a job though! If you need assistance on an employment law issue please contact a member of our Employment Law & Data Protection Team. The Supreme Court ruled the government was acting unlawfully and unconstitutionally when it introduced the fees. 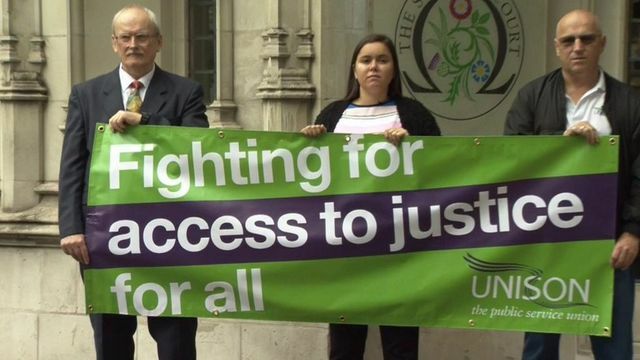 Unison general secretary Dave Prentis said: "The government has been acting unlawfully, and has been proved wrong - not just on simple economics, but on constitutional law and basic fairness too." He added: "These unfair fees have let law-breaking bosses off the hook these past four years, and left badly treated staff with no choice but to put up or shut up. "We'll never know how many people missed out because they couldn't afford the expense of fees."